Lenders have their own clients and their own business to worry about. Lenders have their own clients and their own business to worry about. Your priorities may not be the same as theirs. Just like with your leads, maintaining regular contact with lenders is an important aspect of getting a sale agreed. Dealing with multiple leads and lenders can be a nightmare. With different leads assigned to different lenders, it is all too easy to send the wrong information to the wrong person. Not only does this slow sale completion it could also possibly cause you to be in breach of data confidentiality rules. Therefore, it is of the upmost importance that all the material relating to lenders is organised well. You need a CRM that provides a built in system that allows you to view all the information relating to the lenders you are working with. IDXmatrix does exactly that. 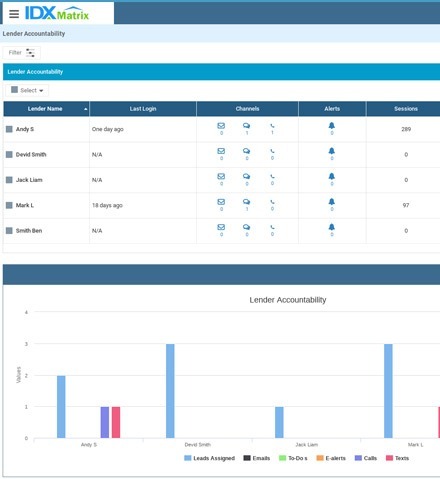 The Lender Accountability tab will show you how many lenders are available and how many leads assigned to each lender. Using this information you can ensure that all your communications are accurate and efficient. By being able to access this data easily, it makes deciding which lender to assign to a new lead a simple and straightforward process. The IDXmatrix CRM not only allows you to see the lenders available and the leads already assigned to them but it also logs all communications, the number of texts, calls, and emails sent are listed and displayed in a graph format, so that the information can be ascertained with just a quick glance at the Lender Accountability tab.